I’m glad I got Bloxwich in when I did, in August this year, as they have now sadly resigned from the Midland Combination. They only started out in 2006 as Birchills United and were playing in the other Birmingham-centric step six league – the West Midlands Premier League – until switching sideways to the Midland Combination for this season. Despite being a new team Bloxwich has a long history of football clubs, and unfortunately, a long history of football clubs folding. 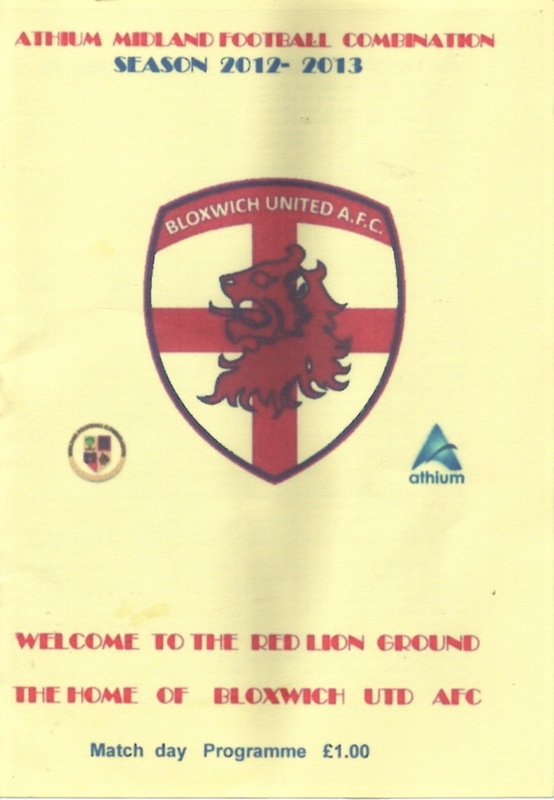 The Red Lion Ground is actually very old dating back to 1910, first used by Bloxwich Strollers, who go back to 1893. More recently Blakenhall FC used the ground before merging with Bloxwich Town to form the first incarnation of Bloxwich United who went bust in 2001-02. Hopefully, before long, they will rise yet again like Dracula in the Hammer movies and inhabit the charismatic Old Red Lion Ground. They have a cosy clubhouse in the Red Lion Pub, which sits just off the main A34 Somerfield Road through the middle of Bloxwich. Bloxwich United marked my completion of the Walsall quartet along with the other three – Rushall Olympic, Walsall Wood and Pelsall Villa. Exiting the pub there is a very old stand behind the goal, similar to Pelsall Villa. Like at Hyde’s ground, the stand is at a few degrees angle to the pitch. It stretches almost the whole side, buty a lot of the seats are either missing or in a state of disrepair. It is a compact venue, with the main road flanking it on one side and houses snuggling up on the other three sides. Aside from the main stand there is a tiny bit of terracing in front of the dressing rooms, next to the pub. At the time this game was played Bloxwich were 100% at home and I think continued this form until their resignation. The game was not a great one, with Stafford Town playing a long ball game from start to finish that reaped no rewards. It was disappointing to see no adaptation from them or change of style, and because of this Bloxwich deserved their 1-0 win, thanks to a hard low strike from the edge of the area in the first half. One goal was always going to be enough. It’s too historical a ground, with such memories soaked into the timbers supporting the stand, to just fall by the wayside. Football needs to be played here and its heritage kept, so the quicker a new team emerge to move in the the Old Red Lion Ground the better. This entry was posted in Travelog and tagged Bloxwich United, midland combination, Red Lion Ground, Stafford Town. Bookmark the permalink. Fortunately, life is still there at the Red Lion Ground. The previous tenants, Rostance Edwards FC, now own and solely use the ground. They are doing fairly well in Division 3 of the Midland Premier League, two leagues below where Bloxwich United were before they folded. Thanks for the update, it’s great to hear the ground still being used, it was a quirky one. I hope Bloxwich appear in some guise or other again shortly. 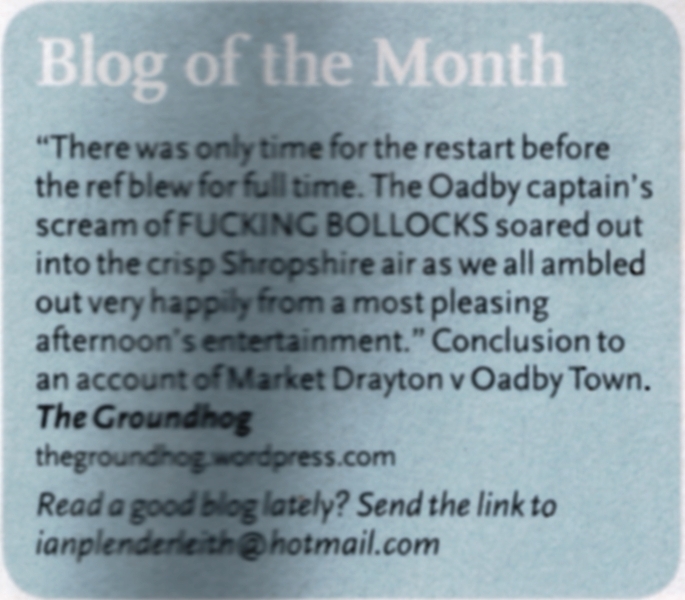 Thanks for the review, I’m off there next Saturday with Alcester Town FC (we’re also in the Midland League Div 3) vs Rostance Edwards and it’s nice to know about the history etc. You could come and review our ground but it’s still very much a work in progress.